Welcome to the Strainprint Community Understanding Terpenes Series. 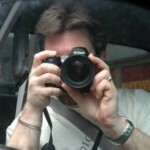 Before diving into the details behind terpinolene, the multi-talented terpene produced by cannabis known for its antioxidant and anticancer properties (it is also one of the few terpenes to offer no anti-inflammatory benefits), it behooves readers to develop a solid understanding of terpenes as a category of wellness molecule. Patients gain advantage by knowing how terpenes compare to the other group of healthy chemicals produced by cannabis called cannabinoids (including tetrahydrocannabinol [THC] and cannabidiol [CBD]). The first article in the series, featuring the terpene myrcene, offers a great primer on terpenes, and cannabinoids; you can gain more understanding here. 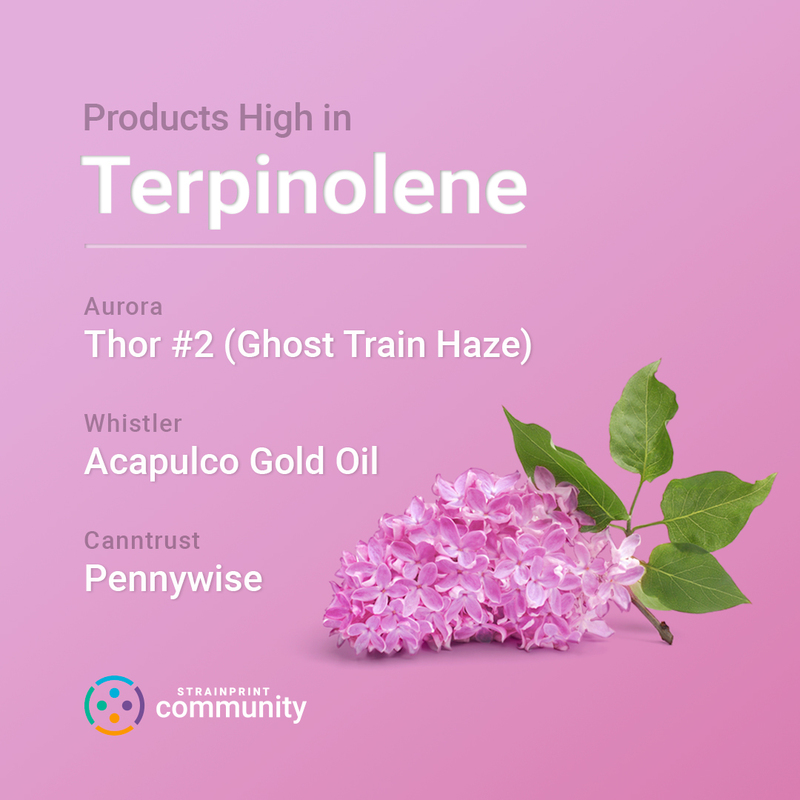 Terpinolene, sometimes denoted in research literature as TPO, is a terpene found in hemp and cannabis that produces a floral or herbal aroma reminiscent of pine needles. It is categorized by leading research laboratory SC Labs in Berkeley, California as a primary terpene. Although common in cannabis cultivars, terpinolene is typically found in relatively low amounts. This terpene is also employed as an ingredient in lotions, insect repellent (similar to other terpenes), perfumes, and soaps. Like most other terpenes, terpinolene is produced by a variety of other plant species, including apple, conifer, cumin, lilac, mint, nutmeg, parsnip, and tea tree. Cannabis cultivars known to produce sufficient quantities of terpinolene to elicit positive efficacy include Acapulco Gold Oil by Whistler Medical, Arjan’s Haze #3, Pennywise by Canntrust, Dutch Treat, Thor #2 (Ghost Train Haze) by Aurora, Sensi Star, Shipwreck, Sour Tangie, Sour Tsunami, Snowcap, and Super Lemon Haze (also a CBD-rich cultivar). Cannabis cultivars with relatively large amounts of terpinolene also tend to be THC-dominant. Patients who are sensitive to THC or demonstrate negative side effects (such as extreme anxiety or panic attacks) should carefully experiment with terpinolene-dominant varieties. Terpinolene has been shown, through research studies and anecdotal evidence, to produce a wide range of efficacies, including antioxidant and anticancer benefits. Like the terpenes linalool and myrcene and the cannabinoid CBN, terpinolene can exhibit a sedative effect when consumed in a sufficient dose. This makes it effective in the treatment of conditions such as anxiety, insomnia, and panic attacks. This terpene also provides antibacterial and antifungal properties. It may also be part of the treatment of heart disease. Most notable, however, is terpinolene’s anticancer efficacy. Research indicates that it may also synergize with linalool to produce an enhanced sedative effect. Unlike many other terpenes, terpinolene does not deliver anti-inflammatory or analgesic (pain killing) properties. A variety of studies have documented the medicinal efficacy of terpinolene for diseases and conditions from cancer to heart disease. A 2013 study entitled “Anticancer and Antioxidant Properties of Terpinolene in Rat Brain Cells” and published in the journal Arhiv za Higijenu Rada studied the toxicity of terpinolene in the treatment of cancer. The researchers found the terpene to both lack toxicity and also be an effective agent in preventing the growth of cancerous tumors. A 2012 study entitled “Terpinolene, a Component of Herbal Sage, Downregulates AKT1 Expression in K562 [Cancer] Cells” that was published in the journal Oncology Letters employed terpinolene derived from rosemary and sage. It found the terpene to reduce the expression of a protein (AKT1) that causes the proliferation of cancer cells. “We found that terpinolene, a common component of sage and rosemary, markedly reduced the protein expression of AKT1 in K562 cells and inhibited [cancer] cell proliferation,” concluded the researchers. A 2005 study entitled “Terpinolene in Concert with Alpha-tocopherol and Beta-carotene Effectively Prevents Oxidation of LDL” that was published in the journal Phytomedicine found terpinolene—when combined with a nutrient such as Vitamin E, beta-carotene, or flavonoids—to be an antioxidant that may be effective in the treatment of heart disease.